Student, Entry Level Laptop. Details 5 Year Collect and Return Warranty inc All Parts and Labour. 500GB Anti Drop and Anti Shock HDD. Lenovo B50 , 30 Processor Intel Celeron N2830 Dual Core (2 x 2.16GHz, 1MB Cache, Intel Boost Up To 2.41GHz) Screen 15.6 (Lenovo Anti-Glare screen, 1366×768 HD Resolution. LED Backlit) Operating System Microsoft Windows 8.1 with bing RAM Fast 4GB (DDR3 1600MHZ) Hard Drive 320GB Optical Drive DVD Rewriter (Records DVDs 8x & CDs 24x & Warranty is booked through us with Lenovo. Dual Layer Super Multi) Graphics Integrated (Intel HD Graphics) Wireless LAN Wireless (802.11b/g/n Wireless) Network Card 10/100/1000 Gigabit Fast Ethernet Integrated Webcam Integrated Webcam Card Reader 3-in-1 card reader (SDTM, SDHC,MMC) USB Ports 2x USB 2.0, 1x USB 3.0 Speakers Integrated Sound System VGA Port 1 External VGA Port Charge Time 2.0 Hours HDMI Port 1 x HDMI Port Battery Life 3-6 Hours (up to 6 hours with power management) Weight 2 Kg Product Type Notebook Keyboard Type Laptop Keyboard. Office Version is web apps ; needs online web connection. Bundle Software is free to use and via download link . 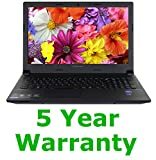 This entry was posted in Laptops And Tablets and tagged 2014, 500GB, Core, Dual, Laptop, Lenovo, Warranty, Windows, Year by Computer Education World. Bookmark the permalink.